In the Wachowski brothers’ latest Matrix instalment, The Matrix Reloaded (2003), a featured scene presents a battle between Keanu Reeves’ Neo and what appear to be dozens if not hundreds of Agent Smith (Hugo Weaving) replicas. 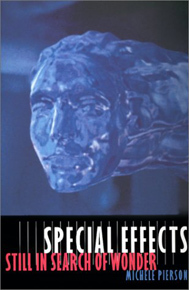 The scene was created, as pre-release marketing proudly boasted, by digitally grafting Weaving’s face onto various stunt doubles, a procedure that Michele Pierson, in her book Special Effects: Still in Search of Wonder refers to in her discussion of CGI applications as “face replacement”. This technique – as she notes – is quite common, but the sheer audacity of the effect in this case draws the viewer’s attention strongly to the assessment of its relative success. As I sat there in the dark watching all those Hugo Weavings, I thought back to the John Wayne movies of my childhood, Roger Moore’s geriatric James Bond, the cheesy private-eye television dramas of the ’70s – Mannix, Barnaby Jones, Cannon. How thrilled and savvy I felt back then, each time I recognised the shot in which a badly disguised stuntman takes a hard right to the jaw, toupee flapping. They’re gone, those moments. Every one of those Agent Smiths looks just like Agent Smith. Such a cinematic event, in its minor way, is an instance of aesthetic transition. In studying cinema we measure transition in movements and genres and styles, in processes and profits, in modes and standards. As witnesses to the digital age, it seems we are recognising some forms of transition with a much greater immediacy, as with Agent Smith or the digital Gollum in Peter Jackson’s version of Lord of The Rings. We remember when they couldn’t do that (and it wasn’t very long ago); now they can. I sense that it is the knowledge we accumulate, not just as students or specialists but simply as viewers, which causes us, in such moments, to leave the movie theatre feeling that something with which we have an important, lasting relationship is forever changed. Michele Pierson’s ground-breaking book details this relationship, one that she delineates as a “culture of effects connoisseurship”, a group drawn from both fans and creators of special effects, linked by various popular science and entertainment publications. In the pages of journals such as Scientific American, Cinefantastique and Wired, she finds the voices of this culture – respondents and contributors to the nature of and transitions in technically achieved spectacular and fantastic effects. Many of us who claim membership in this group just call ourselves “effects geeks”, but the notion of the effects connoisseur is especially insightful with regard to the experience of the modern film viewer, and to that viewer’s increasingly savvy relationship with cinematic technology. The connoisseur, by definition, is a more knowledgeable consumer, and can correspondingly be considered (at least by her/himself) to be a more qualified critic of a given effect’s success. Effects are in this regard critiqued much in the same way as, for example, a mystery screenplay that either succeeds (The Usual Suspects [Bryan Singer, 1995]) or fails (L.A. Confidential [Curtis Hanson, 1997]) in “tricking” the viewer with regard to the “secret” villain. It’s not that the vast majority of filmgoers don’t notice a difference between, say, the dinosaurs of Skull Island in King Kong (Merian C. Cooper & Ernest Schoedsack, 1933) and an iguana with a spiky fin glued onto it; it’s that the effects connoisseur can give you two dozen reasons why the former is a superior effect, can tell you what kind of latex was used to cover the models, and knows what the industry professionals have to say about each technique. Pierson’s study of the relationship between the effects fan, the effects professional and the historical stages of effects technology is undertaken from the perspective of what she calls “the wonder years, a period in which CGI effects became the focus of intense speculation not only for cinema audiences but also for the special effects industry itself.” Through the glass of the “wonder years” she examines the history and future of special effects reception as one would regard ripples in a pool, extending outward from the epicentre of the early 1990s. By connecting these ripples along the axis of a “particularised mode of spectatorship” based around the culture of connoisseurship of special effects in science fiction cinema, she not only provides a refreshingly integrated historical examination of aesthetic response, but in doing so also proffers a compelling glimpse of the direction in which effects development may be heading. Central to this historical journey is the examination of “distinctions between textual and visual literacies [which] too often fail to register their many shared histories.” For example, her first chapter, “Magic, Science, Art”, finds the roots of the kinematographic “trick shot” special effect in the optical illusions of the pre-cinematic popular show, including programs staged for purposes of entertainment, edification and sheer spectacle. Here Pierson ably employs criticism, exposé and technical pedagogy from the pages of contemporary journals of popular science to demonstrate the deeper origin of a culture of effects reception that is now too readily associated only with the movies. The public fascination in the late 19th century with entertainment spectacles that were often rendered with the help of optical trickery is illustrated by pages from Scientific American which demonstrate a keen interest in the inner workings of staged phenomena such as the ghostly “Cabaret Du Neant” and its projected, skeletal ghosts, or the “’Burning of Moscow’ – A Pyrotechnical Drama at Manhattan Beach” accompanied by what are literally behind-the-scenes diagrams. The fact that entertainment consumers in 1886, when these exposés were published, were themselves interested in how spectacles were technically achieved is ample evidence that these consumers, through the same kind of comparison and speculation later applied to cinematic effects, were well in touch with both aesthetic and technical transition. Pierson’s detailed and insightful reading of later publications such as Cinefantastique and Photon provides fundamental, first-hand observations on the technical and aesthetic development of various cinematic effects strategies. She traces the relationship of the connoisseur to effects technology through technical stages, with particular attention to stop-motion animation and the notion of home-based amateur special effects production. While virtually every member of the very small group of professional stop-motion animators in cinematic history got their start in the equivalent of their garage, such comparatively crude efforts routinely achieved (and indeed sought) no more than a foot in the film industry’s door; few if any professional-quality animation effects were produced in this amateur arena. Pierson compares this to the circumstances of the digital revolution: “Converging on Wired Magazine” looks at how the publication “provides a window onto some of the ways that special effects acquired significance for consumers of new media technologies in the 1990s.” Pierson posits the graphic visual style of Wired as an example of a place where “spectacular image production and the commodity form converge.” The visual marketing of digital special effects as well as the growing availability and affordability of digital imaging systems, she argues, provides for the perceived possibility of private digital production that surpasses amateurism – the effects geek’s garage goes studio. Pierson’s point is not only relevant but also resonant – for a current example of what is being accomplished in what was once the realm of the effects amateur, one need only visit the local multiplex. Robert Rodriguez, director of Spy Kids (2001) and Spy Kids II (2003), addresses the home-production boom in his documentary short, Robert Rodriguez’s Ten Minute Film School: Big Movies Made Cheap (2003). “If you want to go out and make movies,” he advises his fans, “those little digital video cameras are great, they do a lot…so be creative, have fun and good luck.” Rodriguez embodies a new philosophy in the creation of special effects, moving away from the big-budget film, employing a do-it-yourself ethic and farming out the really big parts to what are often small digital effects companies. There is a fascinating process of decentralisation occurring in special effects production, and Pierson lucidly locates the origins of this movement and the way in which it, along with the big-budget effects feature, is being fuelled by digital technology. While examining the explosion of effects-laden sci-fi films that dominated the cinema in the early 1990s, Pierson argues that fan-based connoisseurship was perfectly poised for the advent and foregrounding of a new effects technology. Connoisseurship with regard to CGI, however, may be taking its toll on the innovative capabilities of effects producers (not to mention studio budgets), as she notes that specific uses of the technology have not proved as effectively re-usable as other types of effects such as horror film gore make-up. The digital revolution, after all, is the leading representative of the Next Big Thing. We’ve already seen the cell phone with the movie camera; it’s passé, it’s yesterday. And as moviegoers, we’re definitely not going to pay to see another flying saucer blow up the White House. The new reality seems to be that the aesthetic transitions that accompany special effects may now be as much perceived as anticipated. At the same time that she describes this enforced march of progress, Pierson draws a sharp distinction between what she terms a “simulationist” and a “technofuturist” aesthetic for CGI, with the latter expressing and appealing to something other than, or perhaps beyond visual verisimilitude: a “hyperreal, electronic aesthetic”. While the number of examples anomalous to this division may dull its edge somewhat, it is not difficult to imagine Jurassic Park (Steven Spielberg, 1993) as an example of a “simulationist” (extinct monsters not withstanding) and the Matrix films of a “technofuturist” effects aesthetic. For Pierson, this is the heart of the matter when imagining a future for CGI special effects. In this speculative effort, Pierson ultimately finds the “simulationist” aesthetic to be a sort of temporary period during which the capabilities of new technologies in CGI are fleshed out. Thanks to the demands of cinemagoers – and in particular the culture of effects connoisseurship – she predicts that the “technofuturist”, science-fiction special effect will continue to nourish the growth of CGI as an effects strategy, and she elaborates the challenge set before the digital image: either CGI must create something that is perceivably new in a visual sense, or another form of special effect must eclipse it. In the conclusion of her book she examines The Matrix (Larry & Andy Wachowski, 1999) as an example of how the synthesis of a “technofuturist” CGI aesthetic and the conventions of another cinematic form (in this case the Hong Kong martial-arts action movie) can advance the possibilities of digital effects creation. She also ruminates on the interactive and informative possibilities brought to the culture of connoisseurship by the advent of DVD, with home theatre systems and extra features that offer behind-the-scenes looks at effects technology. Despite this last, her discussion doesn’t really raise any question of cinema moving away from the theatrical experience. Home theatre, after all, can still only provide a relatively acceptable simulation of the theatre experience, not a truly comparable one, and even that at considerable expense. Additionally, filmgoers can still see a movie in theatrical release sooner than if they wait for a DVD release (although Pierson does point out that the attraction of related viewing, limited theatrical runs and delayed home format releases are a fact, not a choice on the part of the consumer), and can still feel assured by studios and filmmakers that the cinema theatre is the intended venue for a film, making other formats intrinsically second-best. Although Pierson overlooks these rather obvious factors, her argument overall is far from diminished. By examining the relationship of the effects connoisseur to special effects and to science-fiction cinema via the crucial textual link of popular science- and fan-based publications, this book brings to the fore the voices of those who have always had the most to say about special effects in the movies and elsewhere, even if they were only talking amongst themselves. Applying those voices to academic analyses and theoretical constructs presents exciting possibilities for the further understanding of cultural reception in our most recent history and beyond. Throughout her journey, Pierson engages repeatedly with those who have examined cinema, science fiction and special effects from an academic standpoint. Tom Gunning is here (“Rethinking the Cinema of Attractions”), as are Christian Metz, Vivian Sobchak, Brooks Landon, and others who seek cultural resonance in the cinema of the fantastic. Notably, as Pierson readily acknowledges, the list isn’t all that long. While important study has been conducted in this regard, it seems clear that she is adding her voice to a tragically undermanned section of the academic choir. In any circumstances, however, it must be said that the addition is welcome. Pierson’s journey through the history of special effects offers us an important new perspective – in textual links to the culture of connoisseurship – which has previously been left out of cinema-related academia and formal criticism. Her study is in this way so solidly supported that her reading of the direction in which special effects are heading is given weight far beyond what might be appropriate for “mere” speculation. Where her book presents a prognosis, it is a richly informed one, and represents valuable insight for those of us who find meaning in movies – and that’s quite a number of us, really. While CGI technology had been in use for some years in the cinema prior to this event, what Spielberg is describing marks a very precise moment of transition, one that would ultimately have sweepingly transformative effects. Rarely do we see aesthetic change at such a furious pace. Thus, while Pierson’s study contributes handsomely to the ever-expanding study of digital effects technology and the wonders it may yet reveal, Tippett’s comment above reminds us that the historical component of her work also speaks to the loss of other, earlier effects techniques – forms that have now all but disappeared under the relentless wheels of the CGI juggernaut. As cinemagoers and cinephiles, as connoisseurs and effects geeks, as a culture, we must be careful to protect the histories surrounding these abandoned strategies and their aesthetic qualities. Michele Pierson has with this book pointed out a clear path that leads both forward and backward along this historical trajectory – we are of course impelled in the forward direction, and will see what tomorrow brings despite all our speculation; one must hope that more, like Pierson, will choose to retrace the course of the path, to also see what can be discovered in the spectacles of yesterday.